Thousands of years old, Greek myths have been told and retold countless times and in countless ways, inspiring works of art, music, literature, and film. Many of us first encounter these tales of wonder as children. So it is no surprise that many authors—from Nathaniel Hawthorne to Bernard Evslin to the D’Aulaires—have presented collections of these timeless stories for children. 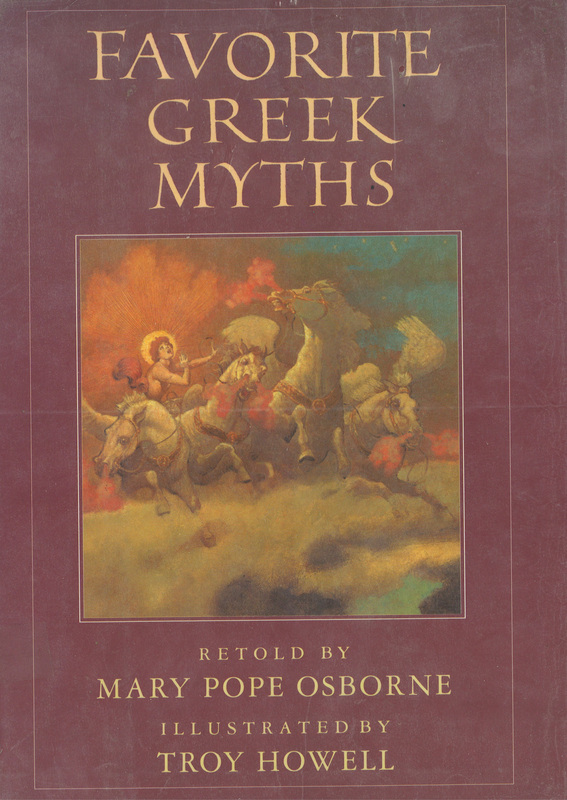 Mary Pope Osborne published her collection, Favorite Greek Myths, in 1989. Presented within are a dozen stories. Nearly all are derived from the Roman poet Ovid’s Metamorphoses, as the author states in her introduction. This collection includes some of the most famous myths—likely familiar even to those who aren’t students of mythology—as well as a few lesser known tales. Each story is presented in three to six pages—easy reading recommended for ages 8 & up—and is preceded by a plate illustration. The full-color, full-page illustrations by Troy Howell beautifully depict memorable scenes from each myth. Included are the tragic tales of Phaeton and the sun chariot (pictured on cover), Arachne’s boastful weaving, and Orpheus’ journey to the Underworld to recover his love, Eurydice; the cautionary tales of Midas’ golden touch and Echo and Narcissus; Apollo’s pursuit of the nymph, Daphne; the race of Atalanta and Hippomenes; the sad tale of Ceyx and Alcyone; and the story of Callisto and Arcus, who become the constellations Ursa Major and Minor. These last two are a surprising choice. Perhaps the gems of this collection are “The Kidnapping” of Proserpine (Persephone) and “The Four Tasks”, the love story of Cupid and Psyche. Both have been abbreviated for younger readers but still retain their captivating wonder. 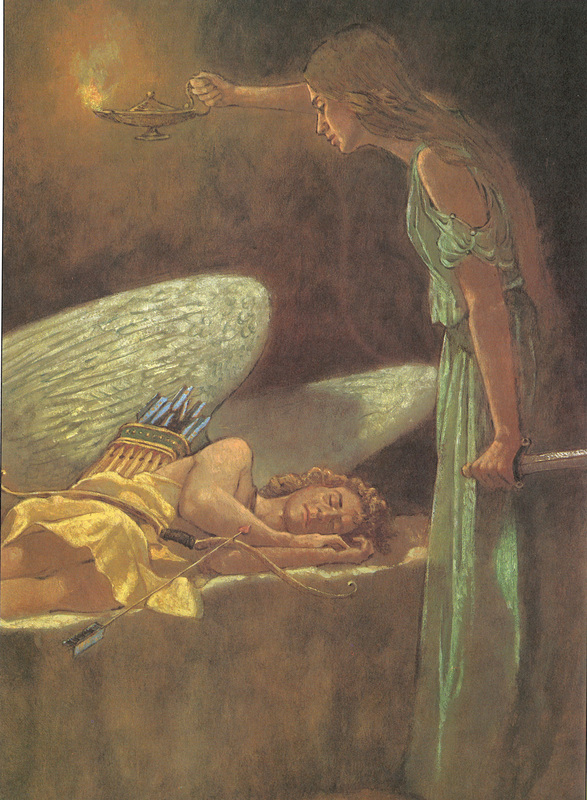 Cupid and Psyche’s story in particular should fascinate all readers. The myth, originating over 2,000 years ago, contains elements that appear later in fairy tales, especially Beauty and the Beast and Sleeping Beauty. The collection ends with the bittersweet story of the elderly couple, Baucis and Philemon, whose exemplary generosity is rewarded. This last story is considered Ovid’s own invention, not appearing in any previous work that comprises canon mythology. Osborne’s focus on just twelve favorite myths gives each story more depth and detail that bring them to life for young readers. By comparsion, the D’Aulaire’s Book of Greek Myths contains more stories but they are far shorter, merely scratching the surface of each. Osborne’s book will be a welcome follow up for those who fell in love with D’Aulaire’s volume and are eager for more of the story. It’s also a pleasant diversion for older readers wishing to revisit these timeless tales. The only real quibble I have with this book is the use of Roman names for the Greek gods. Was it because the primary source was from Ovid (43 BCE – 17 AD), a Roman? This is a very minor complaint though. And the book does include a glossary of gods, mortals, and names to know, including their Greek forms, as well as words that have Greek origins. Mary Pope Osborne has published several books for children inspired by mythology. Of these, Her Tales From the Odyssey series, based on Odysseus’ journey home from the Trojan War is perhaps best known.